Sublime Fusion of Nature and Design, Perfect for Couples. Built on an impressive mountain ridge with tropical, minimalist architecture, it’s a perfect setting for a luxurious romantic vacation experience along with breathtaking Pacific views, which include the magnificent ‘whales tail’ from the National Park. And located among the rainforest canopy, birdwatchers will have a front-row seat for great viewing. 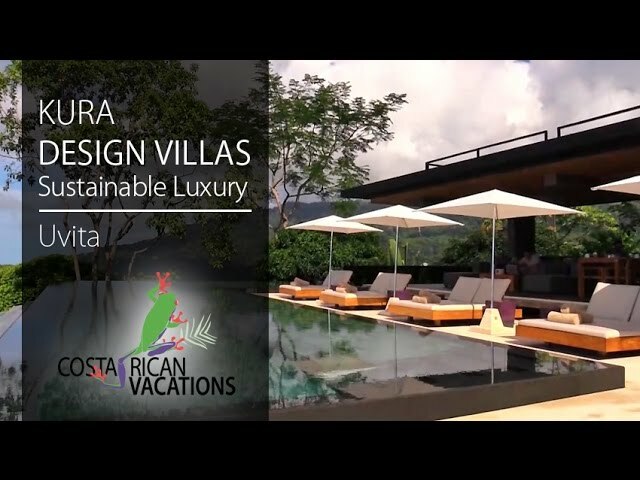 The six stand-alone villas are very private, luxurious, and thoughtfully designed. They all feature king beds, sliding glass doors to a covered terrace with an over-sized hammock for two and amazing ocean views. Double rain glass showers feature the same amazing panorama and are accessible directly from the terrace. Villa amenities include robes, locally-sourced toiletries, binoculars, mini-bar, wine cooler & Nespresso coffee. When planning your stay, pay in mind that you’ll want to spend time enjoying Kura’s stunning features as much as exploring the nearby attractions. Set 1300 ft above the sea level, the highlight of the property is the view. It will be hard to find a better one, overlooking the unique sandbar on the coast—Whale’s Tail, than from the edge of Kura’s stunning infinity pool. It’s an ideal place to watch the birds soar by and enjoy a stunning sunset. Bonus features like an underwater sound system and fire pit make it extra special. The spa offers excellent service that shouldn’t be missed either. Given the small number of guests, the food choices are not unlimited. Kura still offers a great range of fresh and locally sourced food, served in large portions. The menu is thoughtfully designed to include special dietary needs. Kura is the perfect place to indulge your senses and escape with your partner for a very relaxing getaway.